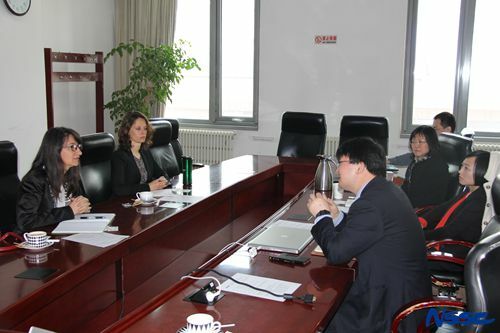 On 21 March 2017, Dr. Annarita Mariotti from Climate Program Office of National Oceanic and Atmospheric Administration (NOAA) and Lauren Kuritz from Environment, Science, Technology & Health Section of U.S. Embassy in China visited the Zhongguancun campus of National Space Science Center. The delegation was met with by Prof. DONG Xiaolong, Assistant Director General of NSSC and Director of CAS Key Laboratory of Microwave Remote Sensing and Prof. LIU Siqing, Assistant Director General of NSSC and Director of Space Environment Prediction Center. A meeting dedicated to introduction and discussion was arranged where both parties made brief introduction about NSSC and NOAA Oceanic and Atmospheric research (OAR) respectively. Prof. DONG Xiaolong briefly introduced the history of NSSC and the Strategic Priority Program on Space Science with focus on the Water Cycle Observation Mission (WCOM), while Prof. LIU introduced the cooperation with NOAA on Space Weather. Through the discussion and exchange of opinions, both parties got familiar with each other’s research activities. 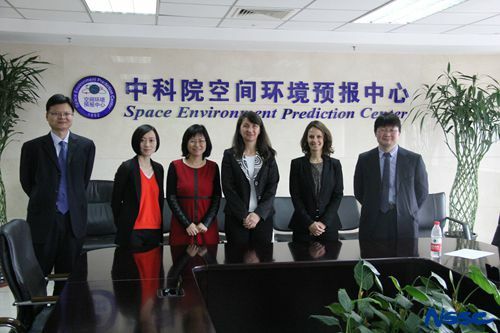 Shortly after the meeting, the visiting guests were invited for technical visits to the Space Environment Prediction Center (SEPC) and CAS Key Lab of Microwave Remote Sensing.